So what are we actually doing to address child poverty? From government there were some welcomed but piecemeal things in the budget last week which included - home insulation, rheumatic fever prevention, early childhood education for vulnerable children - but no sign of a long-term strategic approach to address child poverty in New Zealand. We can’t say we don’t know why too many children, especially Māori and Pasifika children, are cold and hungry. We’ve read enough reports and papers. We’ve received enough feedback from social service agencies and schools around the country. While the government ponders the affordability of child poverty solutions we are seeing many individual people and organisations around the country trying to make a difference now to the lives of children living in poverty. So here’s an update on what’s happening on the broad policy front to keep an eye on. Workshop: Growing New Zealand’s Future:Investing in Our Nation’s Kids. Dr Jilly Evans isn’t sitting procrastinating. Dr Evans recently sponsored a workshop comprising University of Auckland researchers, the Commissioner for Children, Expert Advisory Group members, business, organisational, political and community groups and frontline workers across New Zealand to discuss IMMEDIATE solutions to child suffering. Check out Action Plans for Immediate Priorities. Check out also CPAG’s Child focused analysis of the May Budget and presentations at their nationwide Post-budget breakfasts. Among these presentations was a pearl from Professor Paul Dalziel whose presentation included a focus on Marilyn Waring’s historic work on the impact of accounting rules (based on the United Nations International Rules), introduced back in Muldoon’s day. For those too young to remember, these ‘rules’ rendered women’s work and the environment invisible to the nation’s accounts. And it seems these accounting rules have not changed and may go some way to explain why our children and families (and environment) do not count as much as the economy and why this is reflected in successive government budgets across the spectrum. CPAG continues its valiant effort to end discrimination against 230,000 New Zealand children who miss out on the In work Tax Credit worth $60 or more a week because their parents are not In Work. The CPAG legal challenge was held in the Court of Appeal on 28-29 May. Check out the CPAG website above for updates on the Court of Appeal. Hungry Children : Who is Responsible ? The Government’s long anticipated announcement on Food in Schools was released this week. As anticipated, the KickStart Breakfast programme established by Sanitarium and Fonterra will be extended from 2 to 5 days a week in decile one to four schools. Higher decile schools will be eligible to opt in during 2014. The Government sees this programme as ‘genuine partnership between the Government, the community and New Zealand business which will benefit children”. “Communities will run the breakfasts and provide the bowls and spoons needed”. The government will fund 50 percent of the programme – 9.5 million over 5 years. Fonterra and Sanitarium will fund the remaining 50 percent. Sitting alongside the programme is 1.5 million over 3 years to KidsCan for the provision of shoes, raincoats and headlice treatment. The Food in Schools programme is clearly a step in the right direction in response to a real concern for New Zealand children going to school hungry, but without a meaningful conversation about the underlying structural issues that lie at the heart of New Zealand’s poor child health and wellbeing statistics, the need for Food in School programmes will simply continue. Let’s get it Right says the Children’s Commissioner. “The Expert Advisory Group on Solutions to Child Poverty report released in December last year recommended implementing a targeted Food in Schools programme …“I will continue to work alongside government to support schools to do this well. We will be working bringing together a group of experts to help develop guidelines for schools so that children are not hungry, are not stigmatised and children and their families are engaged with learning”. Goods start but we need to do a lot more than this says NZEI. “To put this in perspective, the $9.5 million increase in cost to extend this programme over five years is less than $2-million dollars a year yet child poverty is costing this country at least $6-billion in health, remedial education and reduced productivity costs. Government Response to the Children’s Commissioner’s Expert Advisory Group on Solutions to Child Poverty (EAG Report). The long awaited Government’s response to the EAG report is out with surprisingly little fanfare! Quietly announced as it was alongside the above Food in Schools initiative and tucked in at the bottom of the Food in School media release. The Government’s somewhat brief response suggests all that can be done to improve child poverty is being done. On the last page however some reassurance is given to those who might think otherwise “The Ministerial Committee will continue to consider the EAG’s recommendation and whether further measures are required – and affordable- over the medium to long-term”. We shall watch this space with interest. To date the Ministerial Committee has not had any discernible impact on structural poverty and inequality! The Amnesty International Annual Report on the State of the World’s Human Rights highlighted New Zealand’s high levels of child poverty and violence against women. Grant Bayldon, Amnesty New Zealand’s Executive Director called this “a stain on New Zealand’s human rights record”. · Up to date with core Well Child/Tamariki Ora checks until they turn five years old. The impact of these ‘social obligation’ on our vulnerable children is a point of debate that will likely continue. Hon Metiria Turei argues that sanctions in the reform “ignored the strong and persistent warnings from the Ministry of Health that her welfare reform sanctions for Well Child/Tamariki Ora would cause “substantial negative impacts on families and to vulnerable children, including risks to increased maltreatment and neglect”. · Supported Living Payment for people significantly restricted by sickness, injury or disability. We’ve been in the news! NZCCSS announced its support for the Living Wage Campaign. The Council encourages all social services organisations to work towards becoming living wage employers. NZCCSS recognises progress towards this goal will be dependent on appropriate funding for services. Therefore the Council urges government and other agencies to fund in a way that allows social support organisations to be Living Wage employers. “Our members see the real value of the Living Wage - it will give all working New Zealanders the opportunity to lead rich and fulfilling lives”, said Trevor McGlinchey, NZCCSS Executive Officer. Living wage Aotearoa New Zealand Facebook Page. “Growing risk inequality and poverty as crisis hits the poor hardest”. A recent report from the OECD Income Distribution Database suggests “Poorer households tended to lose more or gain less then richer households between 2007 and 2010. The top 10 per cent of the population did better than the poorest 10 per cent in 21 of the 33 countries”. It seems NZ had the second largest fall in market incomes of all 33 OECD countries between 2007 - 2010, even worse than Greece & Spain!? Market incomes fell during the world economic crisis for most countries in the OECD but NZ is a "world leader" in the wrong kind of statistic again. 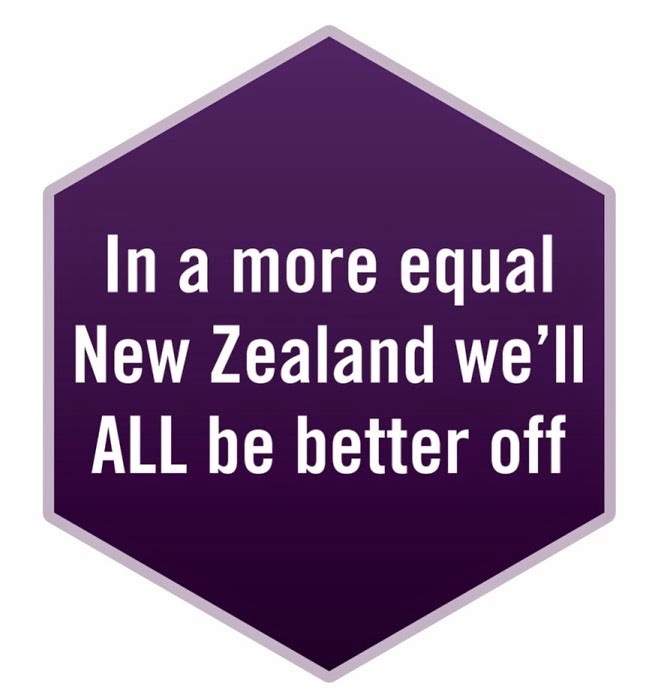 Counting down to the launch of the book “Inequality: A New Zealand Crisis” at the end of June that tells the story of the growing gap between rich and poor in this country. Check out the Bridget Williams Books website where you can order book copies. Professor Robert Wade, a New Zealander now based at the London School of Economics, is one of the contributors to the book. He will be speaking at a one-day conference in Wellington hosted by the Institute for Government and Policy Studies on 18th July as well as giving a series of lectures around the country in July (dates will be confirmed soon). Contact us at NZCCSS if you want to know more. Cutting the Gordian Knot of Housing or Simply Making a Bigger Mess? The Industry Training Organisation Careerforce is responsible for health, disabilities and social services qualifications from level 1 to 6 on the NZQA Framework. These range from very low level induction qualifications through to diplomas for highly skilled workers– but are below degree level. Careerforce is currently undertaking a qualification review. This review is intended to result in a streamlined package of qualifications in areas such as: Aged Care (residential and home and community), Disabilities, Health Care, Mental Health and Addictions, and Social Services. As a result of the review there will be less qualifications in these areas and what people will be able to “ do, be and know” as a result of gaining a qualification will be clearer to potential students and to employers. NZCCSS has been closely involved with the process, providing leadership in the social services area. The Council recently conducted a consultation process focussed on the review. A copy of the consultation report is available here. If you would like more information or want to be more closely involved in the process visit the Careerforce website. The qualifications emerging from this review will be very important in the ongoing development of people working in most social services settings. NZCCSS encourages you to get involved with the process. More Than Churches, Rugby and Festivals : A Report on the State of Pasifika People in New Zealand. The Salvation Army Social Policy and Parliamentary Unit May 2013. This paper reviews evidence on the co-occurrence of intimate partner violence and outlines the negative outcomes for children and young people’s health education, social and economic wellbeing. The paper recommends more active and interlinked efforts to address these issues. Murphy, C., Paton, N., Gulliver, P., & Fanslow, J. (2013, May). Auckland: New Zealand Family Violence Clearinghouse. This paper explores in detail the system responses required to support children exposed to intimate partner violence and highlights key principles for intervention. The paper calls for services to work in co-ordinated and collaborative ways, as part of multi-agency response systems, with a sophisticated understanding of intimate partner violence. Helping others: What can you do? (2013, March, 21). N.Z. : Family Violence It’s No Ok Campaign. The booklet aims to give people confidence to reach out to others they are worried about, as well as some suggestions about the best way to go about it. It is based on research by the It's not OK Campaign which identified what type of helping works best. We are looking for an exceptional and dynamic Executive Assistant to join the leadership team for Philip Richardson, the newly elected Anglican Archbishop of the New Zealand Dioceses. The successful applicant will have a key role enabling the Archbishop to manage multiple demands and relationships. This role is based in New Plymouth. To apply please submit a letter of application outlining in detail your knowledge and experience meets the person specification along with your CV to: www.qjumpers.co.nz, job number 584744. Applications close at 4 p.m. on Thursday 30 May 2013. · What are the causes and consequences of growing inequality? · How might some of the negative social impacts of inequality be reduced? · What are the options for reducing income inequality and which, if any of these, have merit?